Statues, buildings and smaller mementoes of the recent past have been preserved as a reminder of Communist times. The days of Soviet Communism are long gone but reminders of the era are all around Moscow, ensuring it will never be forgotten. Not even the thick morning fog that covers Moscow can hide the Stalinist spires of the Seven Sisters wedding-cake skyscrapers. They are an ever-present, looming reminder of Stalin. The buildings were seen as symbols of a new era, emblems of the triumph of a resurgent country proclaiming its greatness to the world. Even a trip on the Moscow Metro transports passengers back in time to the days when stations, like Komsomolskaya, were built as palaces for the proletariat. 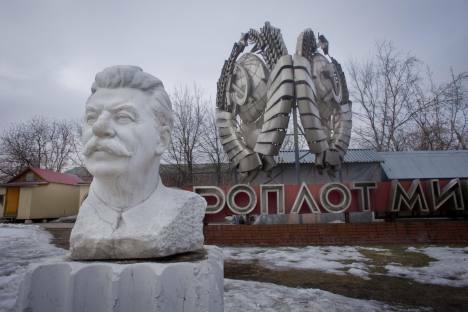 Many of the relics from the days of the USSR are now museum pieces. Statues of prominent Communists that once stood in the city’s central squares were removed after the events of August 1991 which marked the end of Communism. They have since found refuge in the sculpture park at the Museon on Krymsky Val. Among the 700-odd sculptures carved in stone, wood, bronze, and other materials stand six versions of Lenin, a grim Stalin with a chipped nose and a suspiciously athletic Sverdlov (a Bolshevik party leader) peering out eerily in the garden’s snow-white mist. The statue of Felix Dzerzhinsky or “Iron Felix” (the first leader of the secret police) was removed from the museum and placed back in Dzerzhinsky Square several times before finally accepting its fate in the park. The square, which has now reclaimed its original name of Lubyanka Square, is the home of the KGB building which now houses the FSB museum (often referred to as the KGB museum), which opened in 1989. Among its visitors at various times were former CIA chiefs Stansfield Turner and William Webster, as well as representatives of major intelligence services across the world. The museum, which is open by appointment only at certain times of the year, tells the hidden history of the country, starting from the first Russian counter-intelligence against Tatar Mongol invaders up to recently declassified documents concerning the capture of agents and joint work with foreign intelligence services. The model explosive devices and cameras built into beer cans and cigarette packs make you look around anxiously. Among the exhibits are two suitcases in which a Japanese official failed to smuggle women. Stalin’s bunker, or Bunker-42, is 65 metres (200ft) underground (Building 11, Fifth Kotelnichesky Lane). Hidden from sight in the heart of the capital, it was guarded round-the-clock by up to 600 officers for nearly 30 years. In the Sixties, Bunker-42 was fully equipped with everything necessary to survive a nuclear attack. Now, it is all on display as part of the Central Museum of Armed Forces. Walk through secret tunnels, see Red Army weapons and communications equipment, as well as the renovated conference room for the leadership and Stalin’s study. Many Russians remember going on Young Pioneer holiday camps at Black Sea resorts when they were children. And a trip to the Museum of Soviet Arcade Machines (11 Baumanskaya St) will bring those childhood memories flooding back. Organised by three enthusiasts who have scoured the country for broken gaming machines to restore, the museum has three modest rooms packed with them. They include mini skittles and a shaibu-shaibu ice hockey game (named after the traditional chant of fans), and the collection is growing. Visitors can exchange their roubles to play the games. For three Soviet kopecks – about 30 roubles (60p) – you can get a syrupy soda pop from the ancient vending machine at the museum entrance. The old arcade machines were originally assembled at munitions factories and they were remarkably expensive, costing from 2,500 to 4,000 roubles – almost the price of a Zhiguli car. You don’t have to go far in Moscow in search of Soviet-era food. It is sold on the ground floor of the GUM department store (3 Red Square), or you can visit the eateries on its third floor – Festivalnioye Café and Dining Room 57. There are many pseudo-Soviet caf é s in the historic centre of Moscow, as well as more authentic establishments that serve pelmeni (dumplings) and shots of vodka. Start the day with a Soviet breakfast of semolina porridge, which was the staple breakfast for all children in the USSR. The Children of Paradise caf é (25 Nikitsky Boulevard) has a Soviet menu offering 10 types of stewed fruit, soups and lump-free semolina porridge. “Down with kitchen slavery”, reads a poster showing a rebellious housewife that hangs at the entrance to the Soviet-era cheburechnaya – a place that sells meat pasties (50 Pokrovka St). And, sure enough, the cooks and waiters are all male. Here you’ll taste Moscow’s best chebureki (meat pasty) stuffed with brynza (feta-like cheese). Wash it down with a Zhiguli beer or a soda available in every colour from green to purple. For added atmosphere, valve radios play Soviet songs, posters with pronouncements by Soviet leaders adorn the walls and smoking is allowed everywhere. The building of the former Automotive Transport Ministry now houses GlavPivTorg (5 Bolshaya Lubyanka St), a restaurant that replicates Soviet-era ministerial dining rooms. The interior has baize-covered ministerial desks, a red carpet and a library. The Annushka tram restaurant, which was named after the protagonist of Mikhail Bulgakov’s celebrated novel The Master and Margarita , banned under Stalin, is another phantom of the Soviet era. The restaurant shuttles through Moscow’s historic centre, offering a choice of three routes. Board near the Chistye Prudy Metro station.